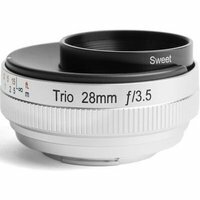 The Lensbaby Trio 28 lens is a 28mm, f3.5 lens that provides a choice of creative options with three selective focus optics in one: Twist, Velvet, and Sweet. Ultra-compact and portable, is it designed for mirrorless camera users, and has a front dial to quickly switch between the focus effects. The Lensbaby Trio 28 is a creative lens suitable for street scenes, landscapes, portraits, and more.